I’m an early bird. If i start my day after 9 o’clock in the morning it is most likely a bad day. I try to avoid this. And that’s why I missed the release of the Castle Live Wallpaper. For “the artist” and “the developer” the (interesting part of the) day starts after 8 pm – after everyday-work and learning. I don’t know why I am not able to think after 2 am. But matter of factly, after 2 am my brain shuts down. My personal theory: I’m solar powered and my accumulator is as bad as the average smart phone battery. 21 September 2012: Today is the day. We are ready! No more changes, no more trees, no more discussions. Today we want to create the final version of the probably (in future) famous Castle Live Wallpaper. Our first teamwork-production. After one month of waiting, watching, thinking, hoping, designing and backbreaking programming is seems possible to get it ready in a few hours. Let’s do it! We were really motivated around 8 pm. But it is not so easy as it seems. Why does the damned to-do-list grow instead of shrinking like it is supposed to? Why is the app description not already written? And do you – the users(*) – really need to have one more tiny little option? I use to go to bed BEFORE midnight — like Cinderella (You know, the beautiful girl from the fairytale …). Not this night, because the plan is not finished yet. 22 September 2012: Until one hour after(!) midnight I force myself to discipline and concentration, but after this I have no patience left and no will to fight against the closing eyelids. I sleep one hour in the office. 2 am I barely wake up. I manage to growl: “I have to go to bed, NOW!” What is the difference between 2 am in the night and 2 pm? It’s already one day later. The only difference I could see was the fact that I’m much happier with 2 pm. So I missed the historical moment – the moment Christoph and Tobbe finished our great first teamwork-wallpaper about one hour after I exhaustedly fell into my bed. Finishing does not mean going online. This historical moment was 2 pm and I was awake and happy to be a part of Sound of Source. *) I really like to think of “The User” like the programms do in the movie Tron (in the old and the new version). What is the most important device for an Android developer? Yes you are right, it is an Android smart phone. But which one? It is the Samsung Galaxy S Plus with Amoled display because nearly everybody (who buys our apps in the Google Play store) uses this type of display. Believe it or not, until now we didn’t have one. A great Ebay investment brought us (by mistake) two different Samsung Galaxy phones. The one with Amoled display and one with a Super Clear LCD display. Do you have an Amoled display? Do you like it? Here some news for you if you never had a chance to compare devices. Do you like green? If you like your Amoled display, you have to. 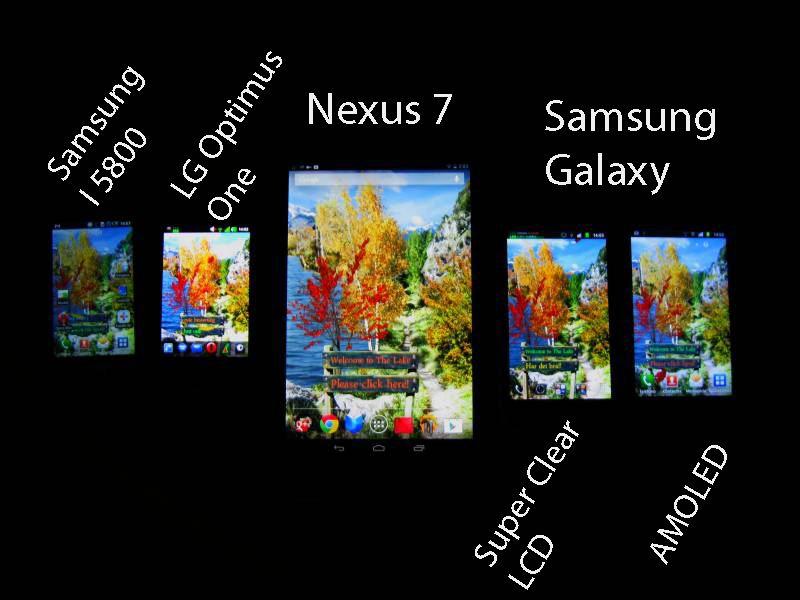 Of all the tested devices the Amoled display is by far the ‘greenest’. Everything appears a little greenish. All three of us like the color style of the Super Clear LCD (Samsung Galaxy 9003) and the Nexus 7 display best. It is not green and the colors come without excessive saturation. Look at the picture! You will see the differences between the devices. 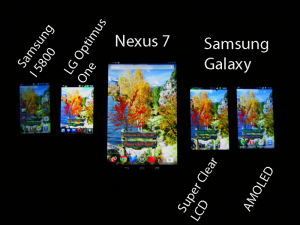 All devices show our Autumn Live Wallpaper Pro, maximum screen brighness and no other screen adjustment. Witch one would you choose? If your device is affected by this green-yellow color tint, too and if green happens to be not your favorite color, we recommend you to try one of the ‘Screen Adjuster’ apps from Google Play. For our wallpapers, these tests led us to implement our own color-adjustment settings in the latest Sound of Source applications (see <a href=”https://play.google.com/store/apps/details?id=de.toar.livewallpaper.rivercastle.free&referrer=utm_source%3Dsosblog%26utm_medium%3Dhref%26utm_campaign%3Dwallpaperpromo”>Castle Live Wallpaper</a> for example). Watch out for ‘AMOLED Color Adjustment’ in ther Performance Settings section of the wallpaper Settings. You see? NOTHING except a list of nice words. I wish we would have a cute pet with a crazy name or something like that in common. But we have nothing in common besides these facts: We are flatmates and we love to think about new apps and we are skilled in producing all kinds of apps. We like words like hidden, beyond, island and so on. But this is only the sound of letters. But what´s what we want to say with this name: I like to have fun, so my favorites are snailbyte, nicetry and a lot more crazy ideas. Tobbe loves to have something middel-class, middle-age like. You should feel like we are very professional and know what we do. Christioph is an artist. He is looking for real enlightenment. I am waiting!